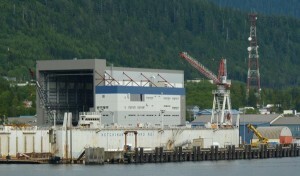 The Ketchikan Shipyard. 2013 Photo by Ed Schoenfeld/CoastAlaska. The Ketchikan Shipyard had a reputation in the 1980s and 90s as a giant money pit. The state spent millions to build it, and critics complained it couldn’t do cost-effective repairs. Operators lost money. The yard closed for two years. Then, with big infusions of state and federal cash, along with local support, the yard got going again. It now provides 200 year-round jobs and is building two major new ferries for the Alaska Marine Highway System. Today, shipyard development director Doug Ward spoke at a U.S. Senate hearing about what he hopes will be the yard’s new reputation, as a model of workforce development for modern manufacturing. Forget grease-stained coveralls. When Ward describes the workers at the Ketchikan shipyard, he describes multi-skilled employees who are furthering their education. Ward says the yard has partnerships with high schools, colleges and tribal organizations to develop a talent pipeline and educate its workers. He says it takes investment from all sectors – public, private and philanthropic – to build a globally competitive work force. And, Ward says, the worker’s education continues on site, to suit the worker’s needs and the evolving demands. “I think those of us that have respect for the frontline worker and begin to treat the frontline worker as a fixed asset with a 30-year lifespan, and if we as a society can provide the educational tools and training tools for them to take advantage of the technology that we have available, that we will be back – certainly in the shipbuilding world – as competitive as any nation in the world,” Ward said. Ward was on a panel to discuss advanced manufacturing, along with a Boeing executive and the president of the Council on Competitiveness. They clearly won over Sen. Al Franken, D-Minn. The yard is owned by the Alaska Industrial Development and Export Authority and operated by Vigor, a for-profit company in the Pacific Northwest. The Ketchikan operation has benefitted from substantial public investment, both to create the shipyard and to develop the workforce. Ward says shifting from ship repair to ship-building was key to the yard’s stability. Ward says the ferry project is about 25 percent complete and they expect to deliver the first ship in 2018.